Concentus Musicus Wien is a baroque music ensemble founded by Nikolaus Harnoncourt and Alice Harnoncourt in 1953. It generated the now well-established movement in performance and recordings to play early music historically informed on period instruments. The original instrumentalists in the group came from the ranks of the Vienna Symphony Orchestra. They gave their first public concert in 1957 in Vienna. Concentus Musicus Wien records for BMG. In the years since then, they have collaborated with numerous rising and established musicians, including international soloist singers. The Ensemble made its Boston debut in 1966 for the Peabody Mason Concert series, and returned in 1971. From 1970–1989, they recorded a complete cycle of the Bach cantatas on period instruments for Teldec. 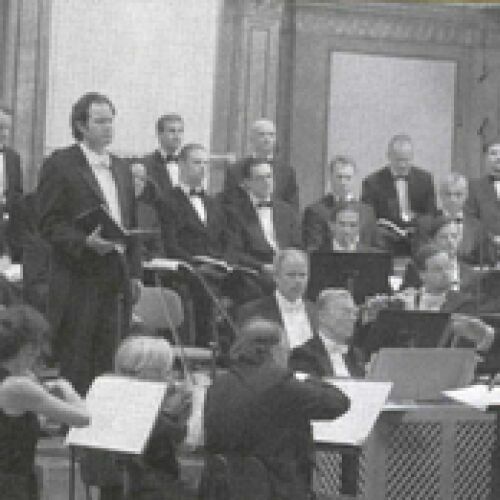 Honors and awards: 1990 and 1991, German Record Critics' Prize – Wolfgang Amadeus Mozart's opera Lucio Silla and George Frideric Handel's oratorio Theodora, respectively 1990, Gramophone Award for Special Achievement – Recording of the complete Bach cantatas 1995, Cannes Classical Award – J.S. Bach's St John Passion (BWV 245) 1996–1997, top awards from three different French music publications – recordings of Mozart's Il re pastore, Antonio Vivaldi concertos, and J.S. Bach motets.